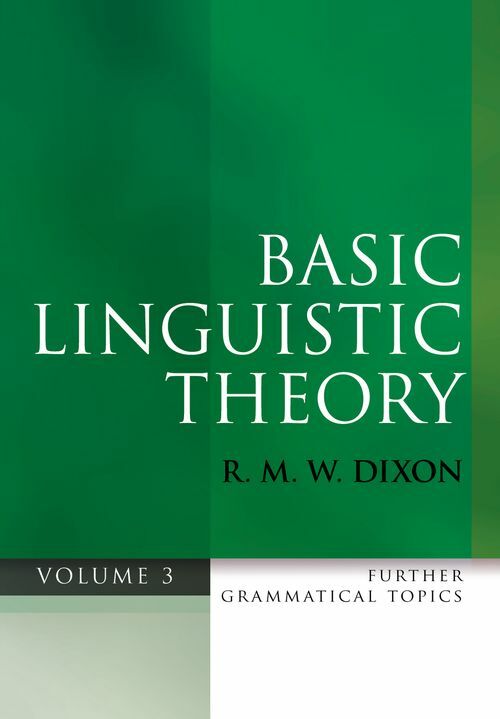 Basic Linguistic Theory provides a fundamental characterization of the nature of human languages and a comprehensive guide to their description and analysis. In crystal-clear prose, R. M. W. Dixon describes how to go about doing linguistics. He show how grammatical structures and rules may be worked out on the basis of inductive generalisations, and explains the steps by which an attested grammar and lexicon can built up from observed utterances. He describes how the grammars and vocabulary of one language may be compared to others of the same or different families, explains the methods involved in cross-linguistic parametric analyses, and shows how to interpret the results. Volume 3 introduces and examines key grammatical topics, each from a cross-linguistic perspective. The subjects include number systems, negation, reflexives and reciprocals, passives, causatives, comparative constructions, and questions. The final chapter discusses the relation between linguistic explanation and the culture and world-view of the linguist and speakers of the language he or she is describing. The book ends with a guide to sources, a consideration of the number of languages in the world, a glossary, and indexes of authors, languages, and subjects covering all three volumes. Volume 1 addresses the methodology for recording, analysing, and comparing languages and includes chapters on analysis, typology, phonology, the lexicon, and field linguistics. Volume 2, like the present work, considers underlying principles of grammatical organization, and has chapters devoted to the word, nouns and verbs, adjectives, transitivity, copula constructions, pronouns and demonstratives, possession, relative clauses and complementation. Basic Linguistic Theory is the triumphant outcome of a lifetime's thinking about every aspect and manifestation of language. The volumes comprise a one-stop introduction for undergraduate and graduate students of linguistics, as well as for those in neighbouring disciplines, such as psychology and anthropology.